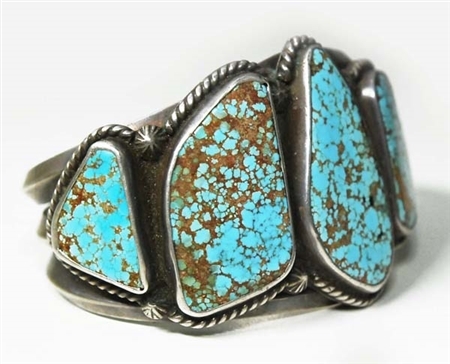 This stunning, heavy Navajo bracelet by Mark Chee is set with 5 beautiful #8 Turquoise stones. Wonderful stamped raindrops with a twist wire, framing the beautiful stones. 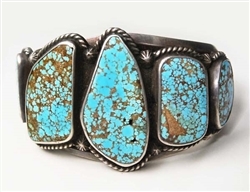 Know for his focus on turquoise, this bracelet is a perfect example of his love for quality stone. 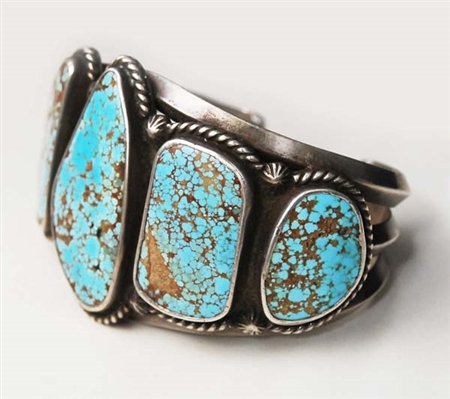 The bracelet measures 1 5/8" at the center/widest point, with an inside measurement of 5 1/8" with a 7/8" gap, slightly adjustable. 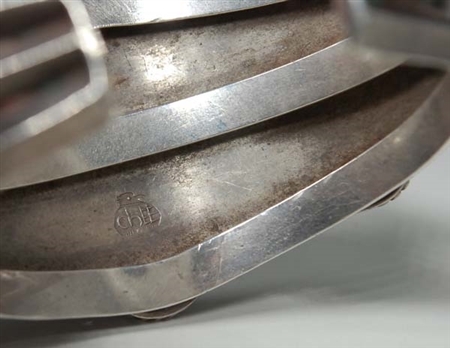 Hallmarked with Chee inside Thunderbird. Note: A matching pendant and earring are also available. Please visit our Artist Biography page for more information on Mark Chee.